He’s in his second year as president, and he’s discovered that even with all the powers of office, he can’t do everything he wants to do, like remake America. Doing stuff is hard. In the past, prosaic work has held little appeal for Obama, and it’s prompted him to think about moving on. What drove Obama was not just ambition, although he is certainly ambitious. As he became frustrated in each job, Obama concluded that the problem was not having the power to do the things he wanted to do. So he sought a more powerful position. Today he is in the most powerful position in the world. Yet he has spent a year struggling, and failing, to enact far-reaching makeovers of the American economy. So now, even in the Oval Office, there are signs that the old dissatisfaction is creeping back in. Thought for the day: what does it say about someone’s temperament if being President of the United States isn’t enough to satisfy him? My answer: that he should probably be teaching existentialist philosophy at a community college somewhere. The basic point of departure between progressives and classical liberals (a term I’m using to encompass any political ideology that supports a free market) when it comes to solving an economic problem is how each deals with scarcity. Scarcity occurs when the demand for a resource like land, labor, or capital is greater than its supply. The lack of the resource (i.e. it’s scarcity) leads to prioritizing how to use that resource most efficiently. This is where public policy disagreements come into play. Typically, progressives see just about everything as scarce, and argue for a neutral government to allocate scarce items fairly. For progressives, there is almost never an instance where the policy impulse to find a way to create more of something. Instead, government’s task is to “spread the wealth around” – be it energy through carbon credits, capital through welfare redistribution, or health care through rationing. Classical liberals are of a different mindset. They start by questioning whether the scarce resource is correctly is really scarce. Consider health care. A progressive would argue that if the number of licensed doctors became static or declined, limiting the amount of patient visits per year would be appropriate in order to “share” the scarce resource of medical expertise over the largest amount of people. A classical liberal, though, would ask whether a licensed nurse could be allowed to take on more responsibility for diagnosing and treating patients with common ailments like colds, cuts, and other minor medical problems. By expanding the amount of people who are licensed to treat patients, the scarcity vanishes because people are allowed to visit a medical professional as much as they need to. Now to the issue of job creation. Rep. Dennis Kucinich (D-OH) is proposing a bill to give people as young as 60 years old a financial incentive to retire early by offering early retirement with social security benefits and health care subsidies paid for from COBRA. The thinking is that are a finite amount of jobs in the American economy, and the federal government must find a way to get older workers out to create room for younger workers. Sounds like jobs are “scarce” these days, right? Not so fast. The workers who have survived the rash of lay-offs are most likely to be those who are highly producing because businesses can no longer afford to carry dead wood on their payrolls. Moreover, if older workers are convinced to leave the job market, that means centuries of accumulated knowledge and expertise will be leaving with them. In the alternative, if it is the low-skilled elderly that Kucinich is targeting (a more likely scenario since guaranteed Social Security and COBRA benefits aren’t enticements for people making more than minimum wage), the vacancies they create won’t be enough to support younger workers with families trying to get out of apartments and into all those foreclosed houses. The better way to look at how to create jobs isn’t to figure out how to best allocate the ones in existence – it’s figuring out how to encourage even more to be created. With more people working the economy will be that much stronger, which will eventually lead to the kind of scarcity only an employer fears: not enough hard-working, qualified people to fill all their employment needs. After a week’s worth of forgettable speeches, President Obama finally made an appearance worth watching. Yesterday’s Q&A with House Republicans was a refreshing reminder that the much maligned political class in Washington, D.C., does, in fact, know something about policy. The ninety-minute exchange also took the focus off elections that are still ten months away. That in itself is enough to commend a repeat meeting because there is still way too much time left in the current congressional session to waste strategizing about outcomes that – at this point – cannot be projected. It is a much better use of everyone’s time to remember that the 111th Congress is barely halfway finished debating the people’s business. And what a debate it was! I can’t remember the last time I agreed with anything David Corn wrote, but I agree with part his column yesterday about the future implications of the historic Q&A between President Obama and House GOP members. Corn thinks a regular meet-and-debate session would fundamentally change the type and skill set of a person running for president. If that means someone who has a deep command of issues, is quick on his feet, and can use a bit of humor – I’m all for it. Besides, it is obvious Republicans want to engage the president on his policies. (In two out of three speeches to joint sessions of Congress, the president has elicited responses from Rep. Joe Wilson and Justice Samuel Alito.) Why not at least give members of Congress – and the president himself – a crack at the opposition face-to-face. While I don’t agree with Corn that the president “cleaned the clock” of the House GOP, I do think he set a standard for depth and poise that should be emulated. Now, for a criticism. The president needs to refer to his interlocutors with the same courtesy for their positions as they do for his. No one will ever call him anything other than “Mr. President”, but his repeated use of representatives’ first name became tiresome. It was also rude. If he’s striving for friendly informality, he should find another way than telling “John” (Boehner, Republican Leader), “Eric” (Cantor, Republican Whip), and “Mike” (Pence, Conference Chairman) why he doesn’t like their proposals. As usual, it comes across as the president speaking down to people. At best, it is a silly verbal tick that needs to be corrected. A final suggestion. Republicans need to embrace this format because it gives them an unparalleled opportunity to debate the president’s policies directly and for the benefit of the American people. This kind of exchange reflects a confident republic at work, and it would go a long way towards softening the partisan tone while at the same time strengthening the quality of policy differences. Instead of criticizing the president for staging a photo-op, Republicans need to talk up his newfound willingness to be open and transparent. Invite him back to speak soon, and often. Keep up the pressure to have a weekly, televised Q&A between the parties and the branches. If nothing else, it will finally reward politicians who study policy and have a knack for making memorable, persuasive arguments. If George Will and Charles Krauthammer are the brains of the conservative movement in print, then Peggy Noonan probably has a good claim to be the heart. While you rarely see her dissect policy minutiae, nobody does an ethereal meditation on exactly where America is at in any given moment quite as well. Not only is the phrase a bit too pedestrian … it’s also a retread from the Carter Administration. Readers of Robert Schlesinger’s excellent book “White House Ghosts: Presidents and their Speechwriters” may remember that “The New Foundation” was actually the title that President Carter chose for the agenda he presented in his 1979 State of the Union. Both the policies and the tag line failed spectacularly. As the Obama Administration starts contemplating staff shakeups, someone in personel might want to start asking around about which White House staffers think that plagiarism is (a) necessary and (b) best accomplished by borrowing from the work that came out of dying days of the Carter Administration. A new study from the nonprofit Highway Loss Data Institute found that rates of crashes before and after the landmark law took effect in 2008 have not significantly changed. It also found that the trend of California’s crashes before and after the law followed that of neighboring states — like Arizona and Nevada — that do not have bans on hand-held phones. “The laws aren’t reducing crashes, even though we know that such laws have reduced hand-held phone use, and several studies have established that phoning while driving increases crash risk,” Adrian Lund, president of the Insurance Institute for Highway Safety and its affiliate, the data institute, said in a statement. Today, President Obama sparred with Republicans at a GOP retreat in Baltimore. The debate lasted about an hour, and covered taxes, spending, health care and federal debt, among other issues. It’s good to see the U.S. following the British tradition of the Prime Minister’s Questions. Before the debate, Republicans were treated to a second lecture by the President. With two lectures in one week, the GOP must feel so fortunate. If you weren’t glued to C-SPAN this afternoon, here is the full exchange. Last month’s “Climategate” revelations exposed thousands of emails between global-warming activist scientists, who sought to conceal and distort climate data, blackball other climate scientists who rebutted their claims and discredit scientific journals. Now, UK authorities have concluded that they also broke the law. According to the UK Information Commissioner’s Office (ICO), the climate researchers at the center of Climategate were requested in 2007 and 2008 to submit data on which they based their global warming contentions. Those contentions were in turn a basis on which the United Nations and global warming alarmists around the world issued their latest doomsday predictions. The US Environmental Protection Agency (EPA) also relied upon them in issuing their reckless carbon dioxide regulations. Unfortunately, the current solution is to sell a series of bond measures to finance the debt. This is exactly the same situation facing the State of California. Yearly budget shortfalls should no longer be patched with accounting gimmicks and stimulus money from the feds. Instead, if the state is going to avoid running out of money on April 1st, Sacramento needs to cut spending – NOW. But the only way that’s going to happen is with a sustained, detail-oriented presentation about the need for systemic reform from someone with access to the media. In effect, California needs a public figure willing to get the electorate to sober up on spending and make a priorities list funded with at least 10% less money than the state has taken in since 2007. True, that won’t be politically expedient for any of the main contenders running to replace Schwarzenegger next year. It may even cost them the election. Then again, no one who’s running needs the job. Republicans Meg Whitman and Steve Poizner have over a billion dollars in wealth between them, and Democrat Jerry Brown wants a third turn at the governor’s mansion. If any of them want to start their tenure off on a realistic foot, they’d be talking about ways to cut, not ways to spend. As Greece shows, at some point the money runs out. Crazy thought: Why not start correcting the problems before they’re too big to fix? Put another way, anybody willing to be a potential martyr for sake of actually telling people the truth? Moving Terror Trials out of New York? That’s the word from the New York Times. If the grassroots outrage didn’t sway the White House, the objections of Mayor Michael Bloomberg and fellow Democrats appear to be enough for the White House to at least consider moving the terrorist trials. Even liberal Democrat Chuck Schumer from New York has gently nudged President Obama away from the New York City location. Schumer recommended to the Administration that they “find suitable alternatives” and that “concerns about costs, logistics and security” might force the trials out of New York. Since costs could balloon to more than $1 billion for civilian trials in New York, the President is rightly balking from his initial decision. Let’s hope his newfound ambivalence leads him to the correct decision. In this week’s Freedom Minute, CFIF’s Renee Giachino discusses the recent U.S. Supreme Court decision in Citizens United v. FEC and the left’s response. National Review Online – Is this Administration Carteresque? Shock Claim: Ford Motors Makes Profit Without Bailout Money! Well, this is interesting. Apparently, Ford Motor Company shocked Wall Street by announcing it made a profit last quarter, and expects to carry that good news over the entire 2010 year. But how can this be? Ford was the only U.S. automaker that didn’t accept a government bailout. In fact, the measures Ford took to regain its profitability look like a blueprint for government owned General Motors and Chrysler: cost cutting, a nearly $700 million profit in its credit line of business, and sales of popular models like the Ford Fusion and Escape. Here’s a thought: since the president doesn’t want to run car companies, why not hire some of the talent (or at least adopt some of the strategies) that got Ford back on the road to sustainability? That way, he could un-nationalize General Motors and Chrysler, putting more money back into the economy, spurring job creation and more tax receipts to fund all his pet projects? You know; the stuff he really does want to do like health care “reform,” cap and tax, and more stimulus packages. Of course, that kind of policy would only make sense if Progressives like the president actually cared about creating a sustainable create-tax-and-spend model to support their statist policies. Anybody want to start a pool wagering how long it will be before the White House starts attacking the “fat cats” at Ford for their non-government-funded prosperity? Those watching last night’s State of the Union Address may have noticed that a third of the Supreme Court wasn’t in attendance. It couldn’t have been an ideological statement because the absentees included Associate Justices John Paul Stevens, Antonin Scalia, and Clarence Thomas. After President Obama castigated the Court’s recent ruling on national television, ABC’s Jake Tapper reports that insult could lead to the other six members finding better things to do during next year’s speech. At the end of Tapper’s piece is an intriguing quote from Franklin D. Roosevelt about his thoughts while getting sworn in by the Chief Justice for his second term as president. Tapper doesn’t comment on the quote, but it’s worth mentioning that FDR’s deviation from the Constitutionally-prescribed oath says a lot about the Executive’s abuse of power up through Obama. Is there any doubt FDR’s current successor feels any differently about his ability to judge how flexible our fundamental laws are? Today, the Senate voted to expand the U.S. debt limit to a record $14.3 trillion, or more than our total economic output last year. We will soon spend more than we produce. Here is the roll call vote. No Republican voted for the measure. The recent weeks haven’t been kind to President Obama. Support continues to drop for his health care bill, his poll numbers are falling and his filibuster-proof majority has been lost. Well, last night, President Obama took out some of his frustration by criticizing the Supreme Court in front of a national audience. As the President, he has the power to trounce on judicial independence, but his display last night was historic. According to the Legal Times, only once has a President publicly criticized the Supreme Court during a State of the Union address. Not surprisingly, it was President Franklin Roosevelt in 1937, and even FDR didn’t call for Congress to overturn the Court (thought the justices would eventually start to capitulate shortly after the address). The Judicial branch also is asked by the people to do its part in making democracy successful. We do not ask the Courts to call non-existent powers into being, but we have a right to expect that conceded powers or those legitimately implied shall be made effective instruments for the common good. The process of our democracy must not be imperiled by the denial of essential powers of free government. Last week, the Supreme Court reversed a century of law to open the floodgates for special interests — including foreign corporations — to spend without limit in our elections. Well I don’t think American elections should be bankrolled by America’s most powerful interests, or worse, by foreign entities. They should be decided by the American people, and that’s why I’m urging Democrats and Republicans to pass a bill that helps to right this wrong. As Justice Alito gestured during the remarks, the Court did not reverse “a century of law” in its Citizens United decision. Austin v. Michigan Chamber of Commerce was decided in 1990, not 1910. Linda Greenhouse over at the New York Times calls out the President on this as well. As a former constitutional law professor, President Obama should either fire his speechwriters or hit the books. 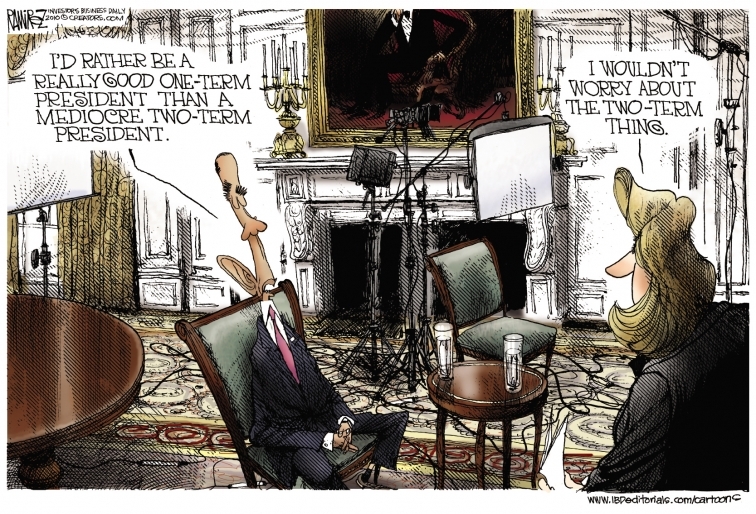 Ramirez Cartoon: One Term President? PC World – Could Citizens United Affect Net Neutrality? The Center for Individual Freedom will be tweeting live during tonight’s State of the Union Address and subsequent Republican response. President Obama’s address begins around 9:00 p.m. (EST) tonight. You can follow CFIF on Twitter by clicking here.